Product #60836 | SKU XSW-D LAVALIER SET | 0.0 (no ratings yet) Thanks for your rating! 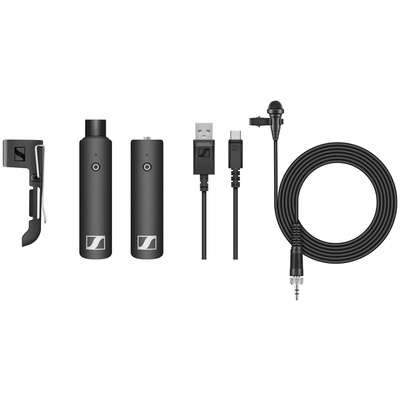 The Sennheiser XSW-D LAVALIER SET is an easy entry point into the world of wireless microphone audio for speakers, educators, panellists, and moderators looking for a stage-ready system that's both cost effective and simple to use. It puts world-renowned Sennheiser wireless sound quality in a miniaturised, plug-and-go, 1-button digital system that anyone can operate. Plug it in, power it up, and you're immediately up and running, streamlining your setup so you can concentrate on delivering your message to your audience with confidence. The set offers the highly popular ME2-II omnidirectional lavalier microphone along with a bodypack transmitter and an XLR-equipped plug-in receiver, both featuring lightweight, miniature housings. The system connects to a wide variety of professional audio gear including mixing boards and portable PA systems, allowing you to capture crisp-sounding speech with the hands-free convenience of a clip-on microphone, for presentations on stage, in lecture halls, houses of worship, or conference rooms. The ever-popular ME2-II lavalier microphone delivers a natural sound, optimised for speech intelligibility. Its omnidirectional polar pattern ensures that the sound remains consistent, even when the talent's head moves away from the mic. The functionality of this XSW-D LAVALIER SET can easily be expanded by adding XSW-D Series transmitters and receivers, as your needs evolve.